Steven M. Kleinhenz, MD is active in the orthopedic community and is a member of the Dayton Orthopedic Society, the Ohio Orthopedic Society, and is a Fellow of the American Academy of Orthopedic Surgery. He is also an assistant clinical professor of orthopedics at Wright State University. 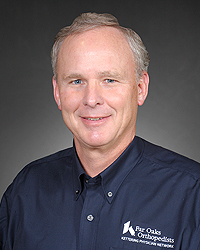 He was Board Certified in 1988 and is on active staff at Kettering Medical Center, Sycamore Medical Center, and Soin Medical Center He maintains a strong interest in adult reconstruction, (shoulder, hip and knee replacement) , and sports medicine. General Orthopedic Surgery and Sports Medicine. Dr. Kleinhenz specializes in orthopedic surgery with a special interest in joint replacement. Dr. Kleinhenz is dedicated to providing every patient expert, individualized diagnosis, treatment, and surgical skill. He believes in treating each of his patients as if they were his own family. Multiple clinical appointments in various hospital committees over last 36 years, including chairman, of the Orthopedic Depts. At both Kettering Medical Center, and Miami Valley Hospital. Orthopedic Resident teacher of the year award.